Tropical forests are perhaps the most well known environments that are immensely important to the health of the planet, yet under threat from human activity. The galleries below show a small selection of my rainforest photographs from 5 assignments I've made over the last few years to help leading wildlife conservation charities tell their stories. This has not been easy, with new challenges each time. High humidity, rugged terrain, drowned cameras, leeches, red tape, suspicious officials, petty scientists, health, the food....oh, the food! But the satisfaction of seeing and getting these photos makes it all worthwhile. Many parts of the world are in ecological meltdown, requiring the combined efforts of indigenous people and the international community to restore them to a more healthy environment for both people and wildlife. But rainforest conservation is often seen as hypocritical, because much of the pressure for preservation comes from the west where once similar environments have long since perished at the hands of the west. Empire building, war and capitalism are the domain of the west, and how the environment has suffered at these hands! How then is a message of co-operation and ecological harmony delivered that can be understood by the illiterate, the politician and the scientist alike? Conservation photography is a universally understood pictorial voice exclaiming not just the beauty of our world but its fragility and diversity as well. It's an introduction to those who have never thought about how wonderful and exciting our planet and its wildlife is, and hopes to convey some sense of empathy and urgency amongst its viewers to inspire them to act in their own ways to save threatened habitats. To achieve this level of photography requires great skill, not just in a technical sense of knowing how the camera works, but in a spiritual and a physical sense as well, as the environments that are most under threat are often those in physically difficult areas to reach and work in. To produce images with an emotional quality in these demanding environments requires great conviction. 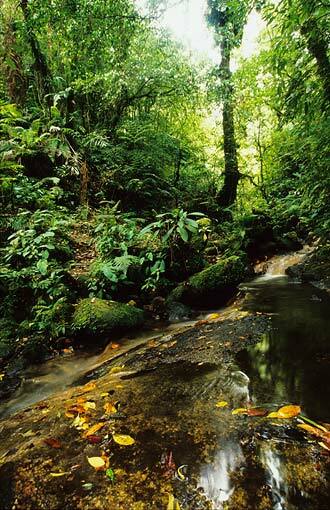 Most tropical forests are dark humid places, placing great strain on the camera's electronics as well as the photographer. Shutter speeds will often be well below that which the photographer feels comfortable with, and knowledge of flash becomes essential. Very little advice is available amongst the photographic community to help other photographers achieve this goal. Indeed, many wildlife photographers seem little concerned with conservation issues - the drive to create a self-satisfying image at a baited hide or feeding station being the main ambition. I hope many more wildlife photographers can find a way of combining their art with conservation effort, be it conveying their amazement of the natural world with non-photographers or educating friends on the conservation issues of today. But we must all try, because one photo can have more conservation impact than a whole journal of scientific papers and survey data. In my humble efforts so far, I hope to have contributed in a small way to the wider effort to allow conservation groups to convey their individual messages.